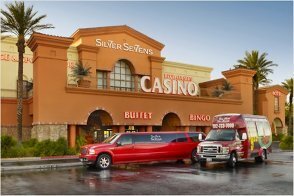 Locals know the truth about Silver Sevens Hotel & Casino. Situated near the Strip and hotspots like the Hard Rock Hotel and "restaurant row," it boasts an ideal location. In fact, it's one of the friendliest establishments in Las Vegas. 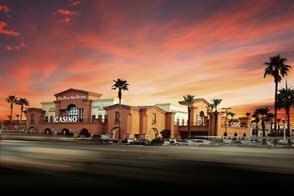 The casino is smaller than many of its Strip counterparts, but it's modern and absolutely loaded with amenities. 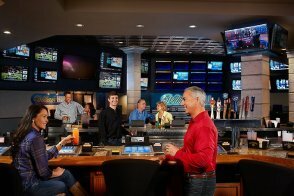 It includes a William Hill Race & Sports Book with leather chairs, table games and countless slot and video poker machines. The Sterling Spoon Cafe, a wonderful 24-hour coffee shop, can curb any craving with everything from American to Mexican and Chinese favorites -- as well as breakfast any time of the day. 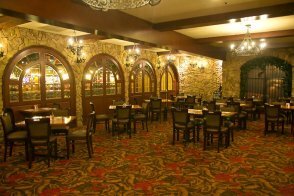 You can also indulge in a more upscale steak and seafood menu with fine spirits in The Back Room at The Sterling Spoon on Friday and Saturday nights. 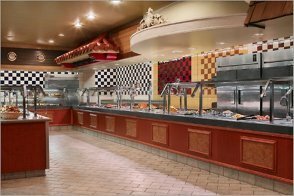 The S7 Buffet is another affordable option offering themed dinners seven nights a week. P.F. Chang's China Bistro, Buca di Beppo, Morton's The Steakhouse, Roy's, the Gordon Biersch Brewery & Restaurant, Fogo de Chao and more are located across the street, only steps away. 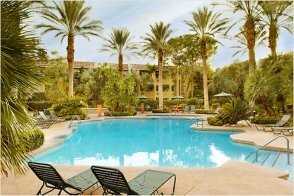 A pool and hot tub in a lushly landscaped courtyard, a fitness center, free shuttle service to McCarran International Airport (for a detailed schedule of departures and pickups, contact the front desk), and a gift shop round out the amenities at Silver Sevens, where you are guaranteed a wonderful stay! Yes, the casino has over 600 slot machines. The casino even features live blackjack, craps, poker and roulette. 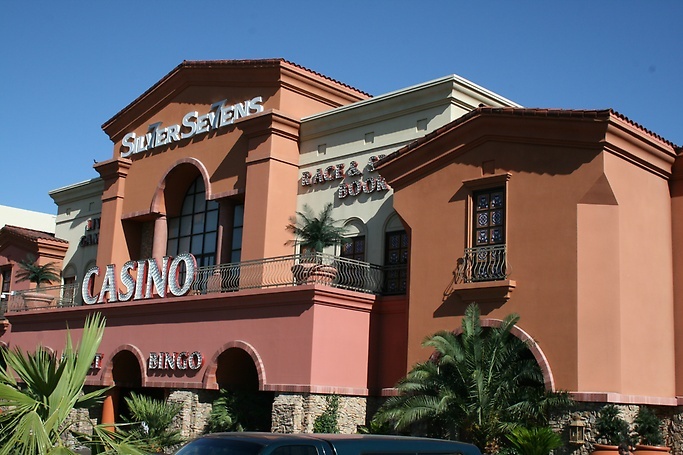 Silver Sevens has the following dining options: S7 Buffet and the Sterling Spoon Cafe. There is scheduled live music at the Corona Cantina. There is a sports bar and the Corona Cantina. Several bars and the Hard Rock Hotel are also just a short stroll away. Yes, and an outdoor spa. Yes, there is a 24-hour fitness center. A gift shop, a convenience store, a wine and spirits shop and a smoke shop. No, but there is a computer with free internet and a printer available at the hotel front desk. Yes. Maximum of 2 pets per room. 50 pound weight limit per pet. $35 daily dog fee. Additional $100 pet deposit. Maid and luggage service, safety deposit boxes, wake-up calls. Yes, a 500 car parking garage. Children 12 and under stay free with an adult. The maximum total number of guests (adults and children) in a room is four. Silver Sevens requires a credit card deposit for incidental charges. The credit card or debit card will be authorized for at least $100 for a room deposit. These funds may not be available for up to 10 days. 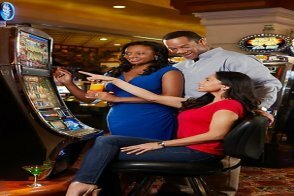 Resort fee Silver Sevens Hotel & Casino has a $20.99 per room, per night resort fee. This fee is not included in your reservation and will be collected by the hotel. Unlimited Wi-Fi access in all the hotel guest rooms. Scheduled shuttle service to and from McCarran Airport. Computer access with internet and printing services at the front desk. Free coffee coupons and much more! This 330-square-foot room offers either one king bed or two queen beds. It overlooks the pool and courtyard and is accessed via a secure elevator (requiring a room key to get to your floor). 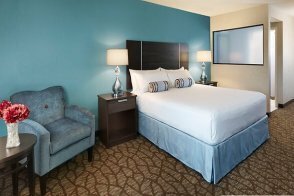 Amenities include a table and two upholstered chairs, a desk and a 42-inch flat-screen television with premium cable channels and pay-per-view movies. An iron and ironing board is available upon request. All rooms are nonsmoking. The bathroom has a combined tub/shower. There is also a vanity outside the bathroom. Newly remodeled, these are the hottest accommodations on the property. 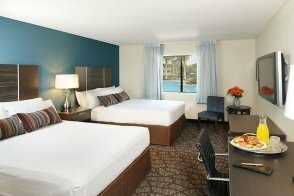 Each 330-square-foot room offers either one king bed or two queen beds. There is elegant wallpaper, carpeting, bedding and furnishings. 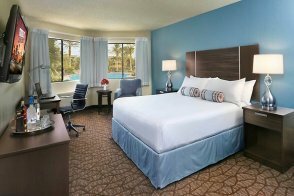 Amenities include a table and two upholstered chairs, a desk and a 42-inch flat-screen television with premium cable channels and pay-per-view movies. An iron and ironing board is available upon request. All rooms are nonsmoking.